infestation durations. 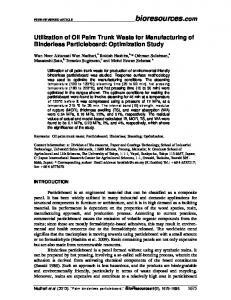 The results of this study provide new data, not only regarding the cell wall properties during white rot decay, but also for the bio-pulping and papermaking industries. EXPERIMENTAL Materials White rot wood flake sample preparation Clear larch (Larix olgensis Henry) samples with dimensions of 90 mm × 10 mm × 1.5 mm (longitudinal × radial × tangential) and 11.4% moisture content were cut from wood located at the 25th annual ring, where the mechanical properties were relatively consistent (Fig. 1). A total of 180 samples were cut from air-dried larch logs. The flake samples were separated into five groups, each with 36 samples, for different infestation durations: 0 (non-infested), 3, 6, 9, or 12 weeks. In each group, 12 samples were used for tensile strength testing, 12 were used for nano-indentation testing, and 12 were ground into powder that was used for XRD, nitrogen adsorption, and FTIR testing. where w is the mass loss of the white rot flakes and w1 and w2 are the weights of the sample before and after infestation, respectively. Tensile strength of white rot flakes C. versicolor on the sample surface was gently scraped off. Shims of dimensions 20 mm × 10 mm × 1.5 mm (length × width × thickness) were taken from Cylicodiscus gabunensis and attached to the ends of the samples with white latex (Fig. 2). The shims prevented breaking of samples in the area held by the clamp due to stress concentration. The samples were conditioned in a chamber at a constant temperature of 20 ± 2 °C and a relative humidity of 65 ± 5% for 24 h before they were evaluated. The machine used during this experiment was an Instron 5582 (Instron Co., Grove City, PA). The tensile speed was set to 2 mm/min during testing. where Crl is the crystallinity of the cellulose, I002 is the maximum intensity of the crystal diffraction angle, and Iam is the scattering intensity of the amorphous region. Porosity of white rot flakes measured with nitrogen adsorption Powders from flakes of each infestation duration were mixed. Nitrogen was used as the adsorption medium in the absorption apparatus. When the nitrogen molecules contacted with wood powder, they were adsorbed on the surface of the powder through surface free energy. where STSA is the micropore area obtained with the T-plot, M is the slope of V vs. t, and V and t are the nitrogen adsorption volume per gram and adsorption thickness, respectively. The conversion constant between gas and liquid nitrogen is 15.74. Cell wall components measured with FTIR testing A Nicolet Impact 410 apparatus (USA) was used for FTIR testing over an infrared spectral range of 4000 to 400 cm-1. The larch powder from three infested flakes was scraped with a metal blade. Then, potassium bromide (KBr) disks were made from 2 mg of wood powder mixed in 200 mg of KBr. Tests were repeated five times for each flake sample. A spectral range of 2000 to 800 cm-1 was observed in this experiment. The peak heights at 1637 cm-1 (representing lignin) and 1066 cm-1 (representing hemicellulose and cellulose) (Colom et al. 2003; Sarkanen et al. 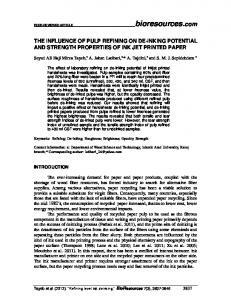 1967) were compared to those of reference peaks to determine the relative changes in the structural components. Peaks at 1510, 1730, and 895 cm-1 correspond to lignin, hemicellulose, and cellulose, respectively. They were relatively consistent and were chosen as the reference peaks. The peak value was calculated using OMNIC software (Nicolet, USA). Tensile Strength of Infested Larch Flakes Average mass loss and tensile strength as functions of the infestation time are shown in Fig. 4. The mass loss of larch flakes increased from 7.00 to 13.63% as the longitudinal tensile strength decreased from 138.8 to 60.0 MPa. The positive Pearson correlation between the mass loss and the tensile strength reduction was 0.949. The greater the mass loss, the more the tensile strength decreased. The cell wall of the wood is closely related to the mechanical strength of the wood. White rot fungus attacks the surfaces of micro-fibrils, destroying the crystalline and amorphous regions at the same time without substantially reducing the average chain length of the cellulose (Klemanleyer et al. 1992). Crystalline regions of cellulose, which affect wood tensile strength, were destroyed by Coriolus versicolor. The tensile strength of larch flakes decreased during the decaying process. Relative Crystallinity of Infested Larch Flakes Figure 5 shows the relative crystallinity of cellulose vs. the infestation duration. The relative crystallinity of infested flakes increased during the first three weeks, then slightly decreased, and finally became constant. 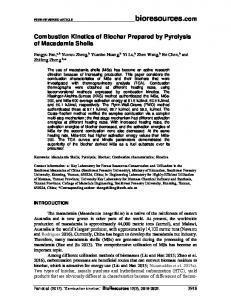 This is because C. versicolor depolymerizes lignin more readily than cellulose, which increases the crystallinity of wood during the first three weeks. The subsequent reduction in lignin content was smaller. 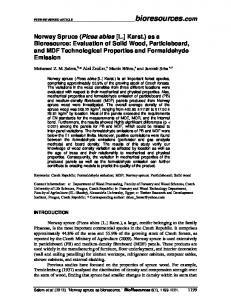 The relative crystallinity of cellulose is related to the mechanical properties of wood. The Young’s modulus and hardness increase and flexibility decreases with increasing crystallinity (Andersson et al. 2003). 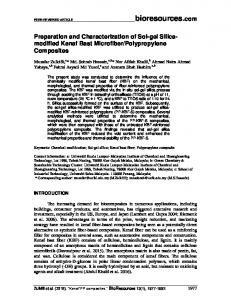 The cellulose and hemicellulose were degraded, causing the decline in relative crystallinity. The fact that C. versicolor attacked the lignin component faster than cellulose at the beginning of decay is consistent with the observations of Pandey and Pitman (2003), who also found that C. versicolor destroys the structural components of wood (lignin and carbohydrates) simultaneously, but with a preference for lignin. after week 3. This is because the lignin was attacked intensely and its content was decreased dramatically within the first 3 weeks. The absorption peaks at 1637 cm-1 changed little after week 9, likely because the intensity of the attack on lignin decreased. This is consistent with the nano-indentation hardness results, which showed that there was no difference in the hardness between weeks 9 and 12. The peak at 1066 cm-1, representing the C-O functional groups of cellulose and hemicellulose, shows strong stretching absorption for non-infested samples. The intensity decreased during the decaying process. The ratios I1066/I1510, I1066/I1730, and I1066/I895 decreased from 0.476 to 0.214, 0.800 to 0.215, and 1.538 to 0.718, respectively, from the control samples to the samples infested for 12 weeks, indicating that cellulose and hemicellulose experienced severe damage from the white rot fungus. The FTIR results confirmed that C. versicolor attacked both lignin and cellulose at the same time. Relative intensities of the peaks at 1606 cm-1 and 1421 cm-1 became stronger during the fungal infestation because lignin was degraded into smaller molecules. With the development of fungal infestation, the peak at 1028 cm-1 (representing C-O stretching of cellulose, hemicellulose, and lignin) increased and the peak at 1066 cm-1 (representing the C-O stretching of cellulose and hemicellulose) decreased. This may be due to the rupture of C=O bonds in lignin at 1637 cm-1, to create C-O bonds. 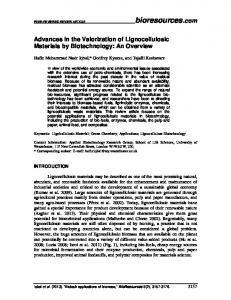 The structural damage of the lignin resulted in a decrease in the nano-indentation hardness. indentation hardness and MOE deceased from 528.47 to 427.87 MPa and 24.0 to 17.1 GPa, respectively. 3. The relative crystallinity increased from 44.24 to 49.81% during the first three weeks of fungal infestation. The surface area and micropore area of the wood’s cells reached maxima of 0.85 and 0.30 m2/g, respectively, after week 3. 4. 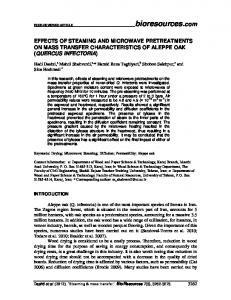 The results of this study indicate that C. versicolor intensely attacked lignin during the first three weeks of decay. Absorbance intensities at 1637 cm-1 (representing lignin) and 1066 cm-1 (representing cellulose and hemicellulose) weakened with increasing duration of infestation. ACKNOWLEDGMENTS The authors wish to thank the State Key Laboratory of the Chinese Academy of Forestry Foundation (CAFYBB2012044) and the National “973” Project Foundation of China (2012CB114506) for their financial support. 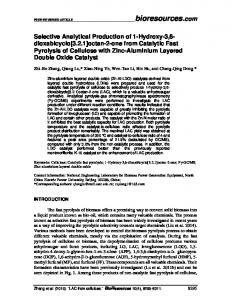 REFERENCES CITED ASTM D 2017 (2005). “Standard method of accelerated laboratory test of natural decay resistance of wood,” American Society for Testing and Materials, West Conshohocken, PA. Andersson, S., Serimaa, R., Paakkari, T., Pekka, S., and Pesonen, E. (2003). 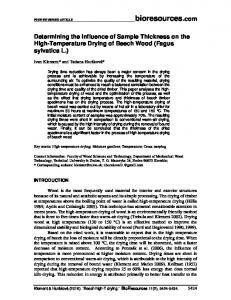 “Crystallinity of wood and size of cellulose crystallites in Norway spruce (Picea abies),” The Japan Wood Research Society 49(6), 531-537. Berben, S. A., Rademacher, J. P., Sell, L., and Easty, D. B. (1987). 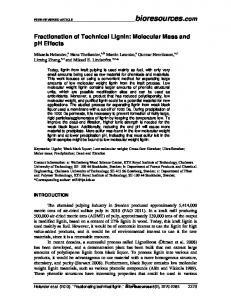 “Estimation of lignin in wood pulp by diffuse reflectance Fourier transform infrared spectrometry,” TAPPI Journal 70(1), 129-133. Blanchette, R. A., Otjen, L., Effland, M. J., and Eslyn, W. E. (1985). 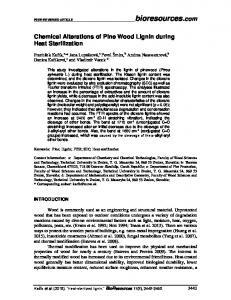 “Changes in structural and chemical components of wood delignified by fungi,” Wood Science and Technology 19(1), 35-46. Brown, R. M. (2004). “Cellulose structure and biosynthesis: What is in store for the 21st Century,” Journal of Polymer Science 42(3), 487-495. Brunauer, S., Emmett, P. H., and Teller, E. (1938). “Adsorption of gases in multimolecular layers,” Journal of the American Chemical Society 60(2), 309-319. Buchert, J., Ratto, M., Mustranta, A., Suurnakki, A., Ekman, R., Spetz, P., Siika-aho, M., and Viikari, L. (1998). “Enzymes for the improvement of paper machine runnability,” in: Proceedings of the Seventh International Conference of Biotechnology in the Pulp and Paper Industry, CPPA, Montreal, Canada, pp. A225-A228. 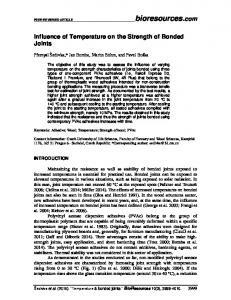 Curling, S. F., Clausen, C. A., and Winandy, J. E. (2002). 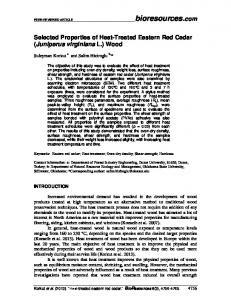 “Relationships between mechanical properties, weight loss, and chemical compositions of wood during incipient brown rot decay,” Forest Products Journal 52(7-8), 34-39. 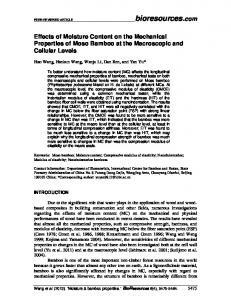 Chang, S., Hu, J., Clair, B., and Quignard, F. (2011). “Pore structure characterization of poplar tension wood by nitrogen adsorption-desorption method,” Scientia Silvae Sinicae 47(10), 134-140. Kojiro, K., Miki, T., Sugimoto, H., Nakajima, M., and Kanayama, K. (2010). “Micropores and mesopores in the cell wall of dry wood,” Journal of Wood Science 56(2), 107-111. 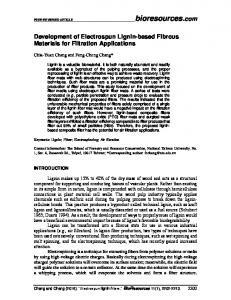 Li, G. Y., Huang, L. H., Hse, C. Y., and Qin, T. F. (2011). “Chemical compositions, infrared spectroscopy, and X-ray diffractometry study on brown-rotted woods,” Carbohydrate Polymers 85(3), 560-564. 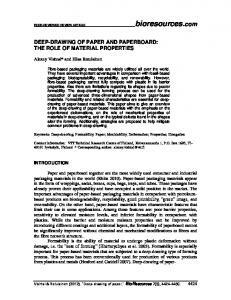 Perez, V., Troya, M. T., Martinez, A. T., Gonzalez-Vila, F. J., Arias, E., and Gonzalez, A. E. (1993). “In vitro decay of Aextoxicon punctatum and Fagus sylvatica woods by white and brown rot fungi,” Wood Science and Technology 27(4), 295-307. Pandey, K. K., and Pitman, A. J. (2003). “FTIR studies of the changes in wood chemistry following decay by brown-rot and white-rot fungi,” International Biodeterioration＆ Biodegradation 52(3), 151-160. Rodrigues, J., Faix, O., and Pereira, H. (1998). “Determination of lignin content of Eucalyptus globulus wood using FTIR spectroscopy,” Holzforschung 52(1), 46-50. Sarkanen, K. V., Chang, H. M., and Ericsson, B. (1967). 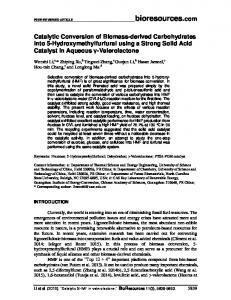 “Species variation in lignins I. Infrared spectra of guaiacyl and syringyl models,” TAPPI Journal 50(11), 572-575. Schultz, T. P., Templeton, M. C., and McGinnis, G. D. (1985). “Rapid determination of lignocellulose by diffuse reflectance Fourier transform infrared spectrometry,” Analytical Chemistry 57(14), 2867-2869. Schwanninger, M., Hinterstoisser, B., Gierlinger, N., Wimmer, R., and Hanger, J. (2004). “Application of Fourier transform near infrared spectroscopy (FT-NIR) to thermally modified wood,” European Journal of Wood and Products 62(6), 483-485. Shao, Z., and Li, K. (2006). 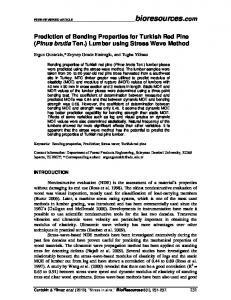 “The effect of fiber surface lignin on interfiber bonding,” Journal of Wood Chemistry and Technology 26(3), 231-244. Solár, R., Kurjatko, S., Mamoň, M., Košíkova, B., Neuschlová, E., Výbohová, E., and Hudec, J. (2007). 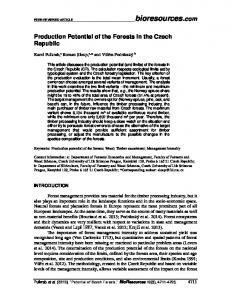 “Selected properties of beech wood degraded by brown-rot fungus Coniophora puteana,” Drvna Industrija 58(1), 3-11. Westermarck, S., Juppo, A. M., Kervinen, L., and Ylruusi, J. (1998). 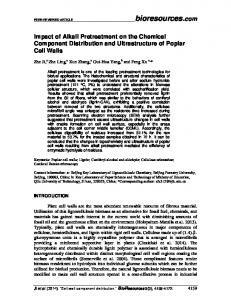 “Pore structure and surface area of mannitol powder, granules and tablets determined with mercury porosimetry and nitrogen adsorption,” European Journal of Pharmaceutics and Biopharmaceutics 46(1), 61-68. Wilcox, W. W. (1978). 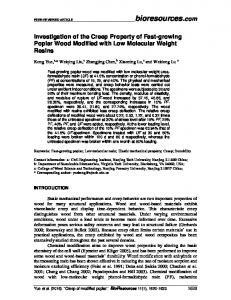 “Review of literature on the effects of early stages of decay on wood strength,” Wood and Fiber 9(4), 252-257. Wimmer, R., Lucas, B. N., Tsui, T. Y., and Oliver, W. C. (1997). 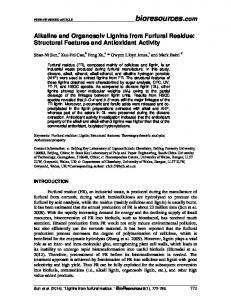 “Longitudinal hardness and Young’s modulus of spruce tracheid secondary walls using nanoindentation technique,” Wood Science and Technology 31(2), 131-141. Winandy, J. E, and Morrell, J. J. (1993). 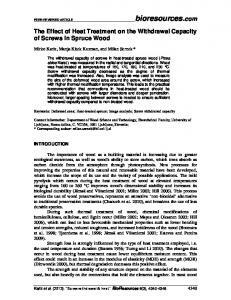 “Relationship between incipient decay, strength, and chemical composition of Douglas-fir heartwood,” Wood and Fiber Science 25(3), 278-288. Yu, Y., Fei, B. H., Wang, H. K., and Tian, G. L. (2010). “Longitudinal mechanical properties of cell wall of Masson pine (Pinus massoniana Lamb) as related to moisture content: A nanoindentation study,” Holzforschung 65(1), 121-126. Article submitted: February 20, 2014; Peer review completed: April 14, 2014; Revisions accepted: May 26, 2014; Published: June 3, 2014.